Crossville has introduced a new porcelain tile collection called Astral Plane, which uses multidimensional graphics applied during the manufacturing process to achieve a natural stone look. 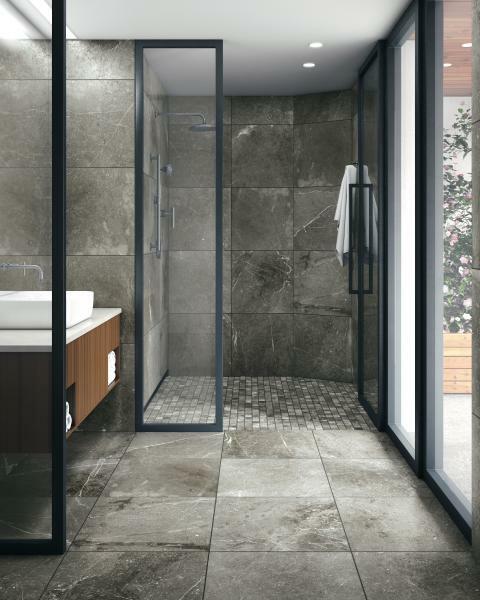 The domestically-produced porcelain tiles come in four different stone-look hues, such as the creamy Altair, grayish Magellan, brown Pavo, and the charcoal blue Draco. The collection is available in three rectified field tile sizes, including 24 inch squares, and 12-by-24 and 6-by-24-inch rectangles, which can be mixed and matched. A random mosaic is also available, as well as a 2-inch square mosaic. Astral Plane tiles are recommended for a variety of interior installations, as well as vertical applications in outdoor settings. As with Crossville’s other collections, Astral Plane is produced with at least four percent pre-consumer recycled content and is Green Squared certified.